Adventure Time and Mad Max: Fury Road Mash-Up Cosplay « Adafruit Industries – Makers, hackers, artists, designers and engineers! Fan art and mash-ups should be their own category of cosplay now because fan creations often inspire others. Artist Ryan May came up with a series combining Mad Max: Fury Road with Adventure Time and published it shortly after Mad Max was released in theaters. The Allison family ran with his concept and turned May’s Princess Bubblegum Furiosa and Flame Princess Wife into cosplay for San Diego Comic-Con. The parents dressed up their little girls in the costumes and spared no detail. 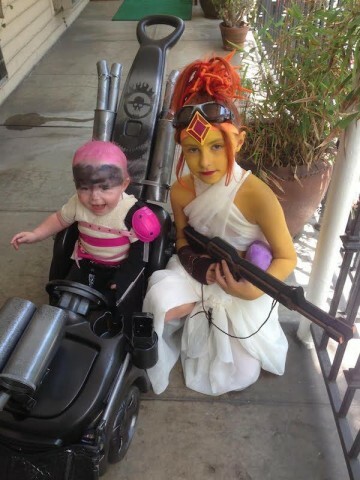 Bubblegum Furiosa’s stroller is all decked out to look like the War Rig, and the Flame Princess’s hair is absolutely perfect.